Domaine Romanee Conti. Chateau Grillet. Santa Margarita Ranch. Okay, so maybe the last one does not ring a bell, but it should! Nestled in the southernmost reaches of Paso Robles lies a single vineyard AVA – Santa Margarita Ranch. The Margarita Vineyard that inhabits this AVA stands out as the only vineyard located within its own namesake region. 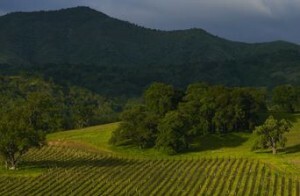 This unique vineyard and AVA is the home of Ancient Peaks winery. Why should you know about Ancient Peaks? Well, besides the fact that it produces elegant and complex wines, there is a history to the place. First farmed by the Franciscan missionaries in the 1780s, the land took a progressive turn when the Robert Mondavi family saw great potential and planted vines in the region in 1999. Eventually, he sold the land back to the owners and as of now, three families own this winery, vineyard and AVA, which gives them complete control over producing wines distinctive to this unique pocket of California. They are entrepreneurs, ranchers and wine-lovers. Named for the peaks at the top of the Santa Lucia range, Ancient Peaks winery prides itself on the diverse soils throughout the vineyard that represent a long geological span. The five soil types are: ancient sea bed, rocky alluvium, shale, volcanic and granitic. Just 14 miles from the Pacific Ocean, and moderated by the mountain range towering over the vines, the Margarita vineyard enjoys a very long growing season, which of course, equals full ripeness in the grapes, giving the wine a tremendous balance of fruit+structure. So what kind of wines does Ancient Peaks produce? In a word, outstanding. But I have 2 picks. For those looking for refreshing whites, the Sauvignon Blanc is a terrific value – crisp and refreshing, yet textured and layered in flavor, perfect for enjoying the rest of summer. For reds, the Renegade is an absolute favorite. It’s rich, it’s dense, but it’s smokey and spicy, offering layers upon layers of floral-pepper-fruit. Drink up. Enjoy! Previous PostLast Winery on Earth – Welcome to Two PaddocksNext PostRating Wines: Is it Art or Science?